A thorough study of God’s Word is important if one desires to mature spiritually and have a better understanding of trials and temptations. In the age of self-help and Google-able answers to almost any question, most people put the Bible at the bottom of their list when it comes to seeking rightful answers. For the past three years, I have committed myself to intense Bible study and this is not so I’d get more brownie points in Heaven, for we know that salvation cannot be attained by good works alone. Studying the Books of Isaiah, Acts, Genesis and Matthew under Bible Study Fellowship International has allowed me to better appreciate God’s Word, the wisdom it provides and how it gives us straight answers on what is right and what is wrong, what is acceptable and what is considered sin. Thorough study of God’s Word, also helps strengthen our “radars” against false prophets. Much like the enemy, false prophets know God’s Word but take it out of context. They misconstrue the meaning of the Word so it would focus on SELF and MATERIAL BLESSING instead of what would glorify God. 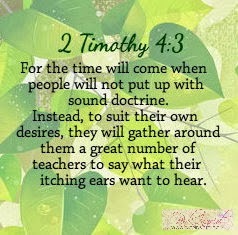 Be wary of false preachers/teachers! 1. Subscribe to a Bible reading plan. Set aside time each day to read through the passage of the day and meditate on it. 2. A notebook and pen are always helpful. “Digest” the passage and write down facts, important people and important events. What is the passage about? Who are the people mentioned? What was culture during that time? Are there any repeated words in the passage? Think of it like a book report. 3. Once you’ve gotten the facts down, learn more by consulting Bible commentaries, concordances and Bible atlases. If you don’t have any in your library just yet, search online or purchase an all-in-one software for your computer. I was blessed to have access to my grandfather’s library of Biblical resources when I was a teenager and he was taking up classes in a seminary. I remember reading Matthew Henry’s Commentary and the one by Warren Wiersbe. I highly encourage you to come and attend a BSF class near you! Men and women’s classes are separate, but both have a children’s school program where you can enroll children to study the same lessons but customized for their age group. You may visit http://www.bsfinternational.org to locate a class and find the time that best fits your schedule.